Interpet is a leading manufacturer of aquatic and pet products and were looking for a solution to help their customers diagnose and understand fish ailments and provide advice on suitable treatment products they supply. 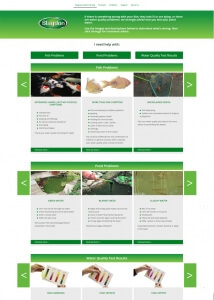 The web application needed to work as well on tablets and smartphones as it does on laptop and desktop computers whilst being easy to navigate with a highly visual guide to the various problems that fish suffer from. We designed and implemented a database driven web app running on WordPress making it easy for Interpet staff to add to or edit ailments and products. The diagnosis pages use bespoke visual sliders to display the ailments in a way that encourages easy browsing. Swipe facilities have been included making the experience a breeze on touch screen devices. 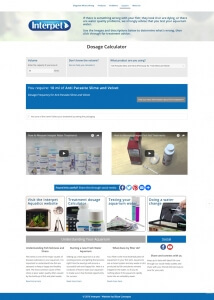 The web site also includes a dosage calculator to help customers who have purchased Interpet products to work out how much treatment they need to apply to their pond or aquarium, as well as a volume calculator to find the volume of the pond or aquarium based on dimensions.